Reduces the risk of chips and scratches to glass windows caused by makeshift tools. 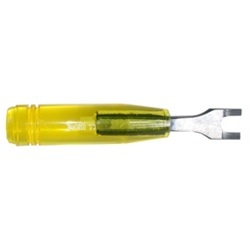 This tool is specifically designed to fit trim clips over the studs and virtually eliminates glass breakage. It also dispenses with the need to remove rubber-like sealant surrounding the studs. A practical tool for placing trim retainer clips over headed studs welded around the body window shields.